I have written about Montana breakfast before. It is a taste of mouth experience. I was an earlier adapter in the Montana breakfast movement. One bite and you're hooked. A quick refresher: home fried potatoes cooked in a cast iron skillet with paprika (the world's luckiest spice) black pepper, garlic powder, cumin and a few other spices--whatever the pantry inspires. These home fries are cooked with peppers and onions, ham, bacon, bacon fat and topped with poached eggs crowned with American cheese. The Skillet is baked to melt the cheese and then the carnage begins. This is certainly breakfast, or a lunch, or late night fuel for a few inebriated individuals. But there is more. People remember Montana breakfast, the iron skillet, the people who shared in the experience. I make mention of this point because some twenty years later someone who had Montana breakfast at a birthday of mine used the old google search to find a recipe for Montana breakfast. Yes, the breakfast from yesteryear. Well, he found us over hill and dale. It seems funny that a breakfast can have that sort of an impact. Though, until you have tried the Montana breakfast you just don't get it. So, dust off the skillet and share the experience. The weather is turning from fall to winter. Somehow the changing of the seasons has sparked my interest in my older notebooks. Since I am revisiting past ideas with a new outlook on food, I felt it only right to share those notes. I have once again used the writeboard approach. These ideas are under the heading The Evolutions of a Cook. The password is notebook. The notes are varied in length and thought, though I have always been stimulated by ideas and know that I am not the only one. Perhaps as it gets colder and darker outside these ideas can be of interest inside. Daylight savings always throws my mind and body for a loop. I either wake up earlier or late depending on the season, it's like I have jumped time zones just by laying in bed. Anyway, whenever I am unsettled--which is often--I head to the kitchen to work out my thoughts. Our kitchen is small and intimate, think home kitchen with a high powered dishwasher which you cannot wash any china in because it is gold plated Versace. That is another story, too long to tell now. Back to puttering in the kitchen, a fine pastime at five thirty in the morning. I truly enjoy working with ingredients, though I do not always know what direction the ingredient will take me. My approach is strongly guided by the principles of improvisational theater. Not every restaurant is able to work in this manner, though our welcoming setting allows for this small theater approach to food. Did I accomplish anything on this early morning? Why yes I did. Still looking to get the most out of ingredients I became focused on simple. We had some Key West Pink shrimp with their heads on as a starting point. We simmered the heads in a shot of espresso and generated an extraction which we seasoned with Crystal hot sauce and soy sauce. 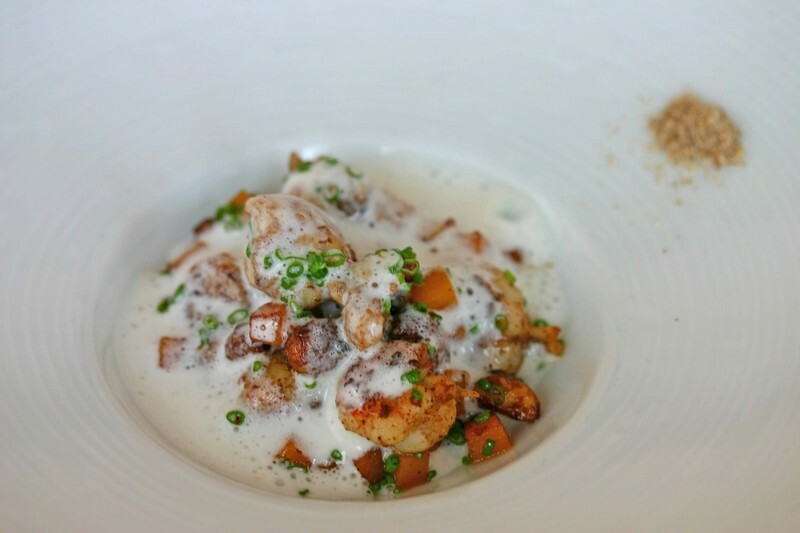 We used the essence of shrimp--a quick red eye gravy-- to flavor whole milk yogurt. At this point we were nearly done. I roasted some cucumber in butter and found our squash relish in the pantry to round out the flavors. 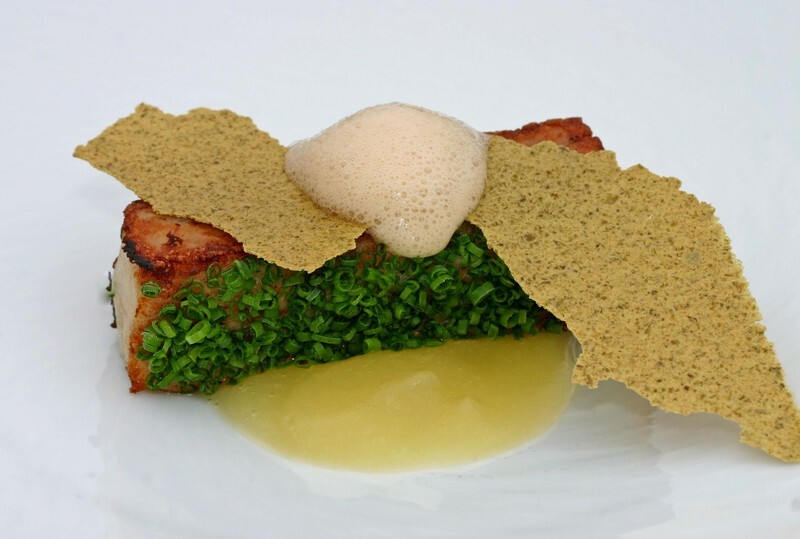 A few leaves of anise hyssop completed the dish. Sweet and sour, a simple concept though the balance is not easitly achieved. 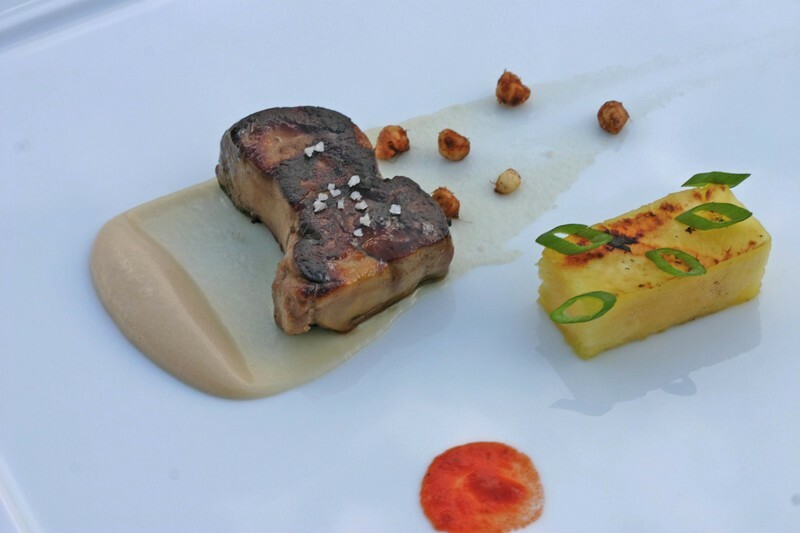 We have spent a fair amount of time on the concepts of balancing tastes. In our most recent applications I have been working with the combination of buttermilk and maple; not a particularly clever thought--think buttermilk pancakes--but one which has flavors I truly enjoy. I added a bit of a twist to the puree by using smoked maple syrup, although true breakfast aficionados would note I have merely included the element of bacon. My point, the combination of simple flavors work well. The key for us is to strip away the extraneous in order to present focussed flavors with a clear aesthetic. 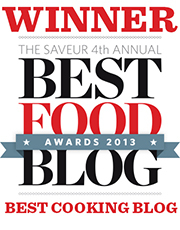 Now we just need to figure out what we are going to use our buttermilk-smoked maple puree for. Here goes. Today we began working with olive brined meats. On the day of idea inception I immersed some Antelope in olive brine. This morning we began cooking, tasting and leap frogging with the results. The brine permeates the meat nicely and balances the gamey flavor. I look forward to using the brine with lamb. In our initial developments we paired the meat with typical olive garnishes, mustard, apple cider and our new cranberry olives. I think we are just scratching the surface with the uses for olive brine. Think about shortribs and lamb neck marinated in olive brine before braising. And these are just straight forward uses. Imagine if we were inventive. As I mentioned earlier I needed to make olive brine caramel. Well, I did and the flavors were more than I could have hoped for. 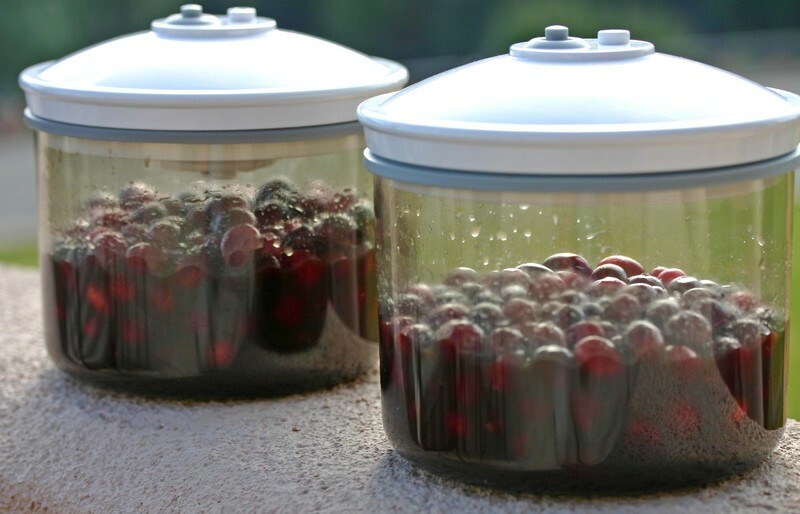 I used the caramel immediately to dress some of our cranberry olives in order to intensify and balance their flavor. I look forward to drizzling the caramel on coconut ice cream to serve with roasted pineapple and foie gras. In the meantime, I applied the caramel to a combination which works--olives and yogurt. 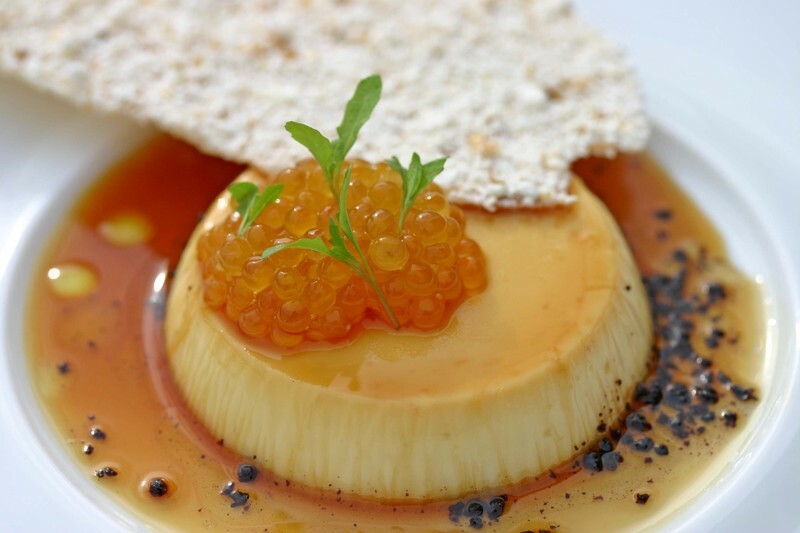 We infused the yogurt with mahleb and then poured the base on top of the olive caramel in ramekins to set the base. Once the yogurt was set, we adorned the creme caramel with wild char roe, epazote, Armando Manni's olive oil and a side of smoked popcorn. I had left over olive brine and wanted to put it to good use. That is how many evolutions take place in our kitchen. I thought about curing grapes in the brine, of course I did not have any grapes. However, I did have some nice cranberries. Beautiful. I heated the brine up and poured it over the cranberries. I let the mixture cool and low and behold I had cranberry olives. The flavor keeps getting better. I was so pleased with my findings I had to share these thoughts. I picked up the phone and dialed Wylie at WD-50 . He would get cranberry olives. In fact, he got more than cranberry olives. He mentioned he used to make a caramel with the olive brine. Brilliant!! I had to make olive brine caramel. The great point from the converstaion is it opened the dam of thoughts to what one could use olive brine for. Sure, I could make a huge amount of dirty martini's, but that would just lead to a headache. Rather, I have begun brining fish and meat in the olive brine, as well as making grape olives, and making apple-olive brine puree. Further thoughts keep emerging and evolving. It began with an idea, I shared it and now the river of ideas flows freely. It is an important reminder about the evolution of ideas and the sparks which cause inspiration. Sometimes I find myself wishing for a piece of cake. 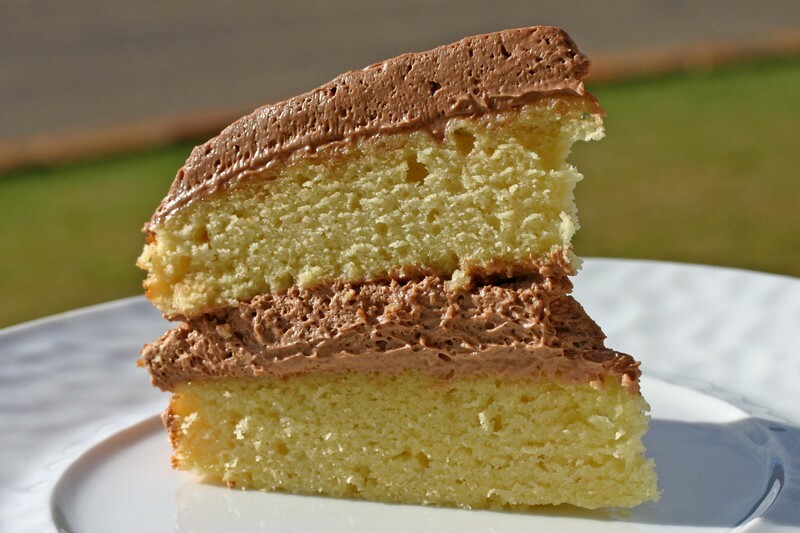 At those moments I want something simple and reminiscent of the ones I grew up with, like a yellow cake with chocolate frosting. It’s nothing fancy or architectural, nothing I have to think about before enjoying. It is simply pure pleasure for the child in us all. Take your favorite yellow cake recipe and bake it in two layers. As it cools, take 16 ounces of heavy cream and heat to boiling with a pinch of salt. As the cream is on the stove chop 16 ounces of your favorite chocolate, today I used gianduja, and put in a heatproof bowl. Pour the hot cream over the chocolate and stir until completely melted and homogenized. If you like you can add a splash of your favorite liqueur. Place in the refrigerator to chill, stirring occasionally. When the ganache is cold, place it in the bowl of a mixer and whip to your desired consistency. Place one cake layer upside down on a plate and spread with half of the ganache. Top with the other layer and spread the top with the remaining ganache. It’s the perfect cake for a household like ours, the frosting is thick for those that like it and easily removed for those that don’t. Cut a thick slice and pour yourself a cup of coffee. Find a quiet, comfortable spot preferably with a view and enjoy the experience. 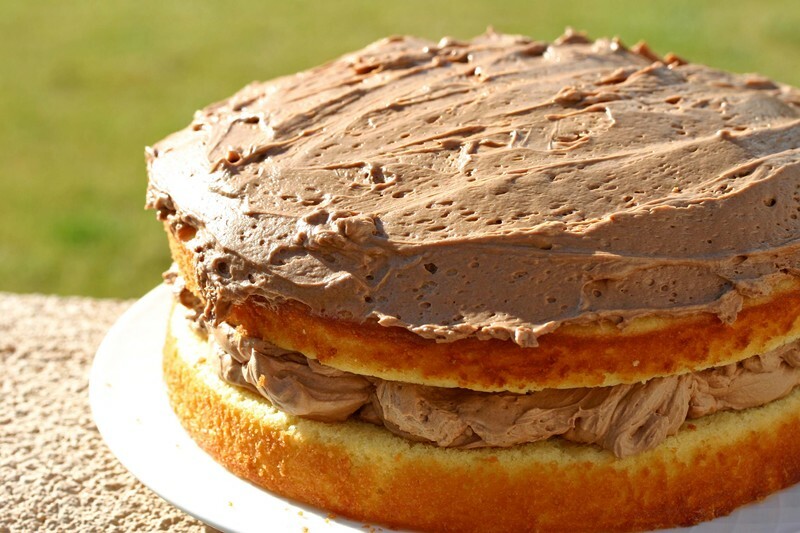 Tender cake and fluffy, nutty chocolate, now what could be better than that? I truly enjoy guacamole. Anytime I can make or eat it I am usually in a better mood. I have also enjoyed the pairing of avocados and bananas both savory and sweet. This morning I left out the avocado in the banana avocado combo, but added many of the great flavors of guacamole. I was then staring at banana guacamole. I had some idea of where to use the guacamole, paired with wild char roe, though I also wanted to sit down with some chips, a margarita and a football game. Being that it is Thursday morning, I reverted back to my initial concept. We topped the guacamole with a dollop of the wild char roe, a date chip and our grape-chipotle sauce. You will note that in the previous post, Alex's recipe failed to offer a technique... when I queried him on this he answered: "It's ganache. Everyone knows how to make ganache." I will refrain from comment on his reasoning, but for those that don't automatically know how to make ganache I have taken the liberty of republishing it here with a method in addition to his list of ingredients. Have all of your ingredients except the cream at room temperature. Chop the chocolate and place in a heat proof bowl with cranberries, smoked maple syrup, horseradish and salt. Heat the cream just to a boil and pour over the chocolate mixture. Stir steadily with a heatproof rubber spatula until the chocolate is fully melted and the ganache is smooth and fully incorporated. Let cool to the desired consistency before using. Ganache can be chilled for storage and gently reheated over a water bath or in the microwave. Grind powdered sugar, almond meal and cranberry powder in a food processor to a fine dust. Set aside in a bowl. Whip egg whites to soft peak, add granulated sugar and continue whipping to stiff peaks. Fold in dry ingredients in two batches till thoroughly blended. Place in a pastry bag fitted with a plain tip and pipe onto a parchment lined sheet tray. Pipe the batter in one inch circles one inch apart. Bang the tray on the counter a few times to set the cookies and bake 15-18 minutes rotating once during the baking until golden brown and slightly shiny. Let cookies cool before removing from parchment. Once cookies are cool, spread flat side with a layer of ganache and sandwich it together with another cookie. 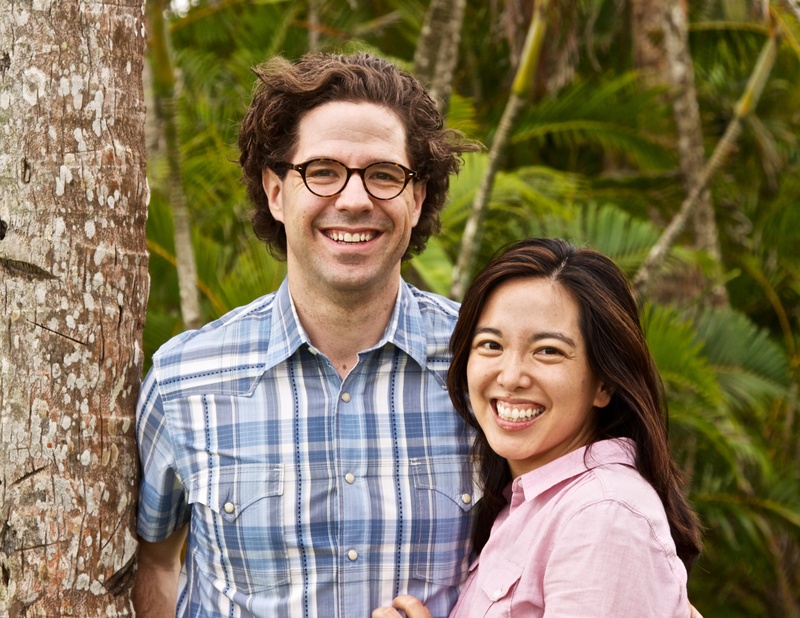 In true husband and wife fashion we approach food and the formation of recipes differently. We began working on some playful macaroons, today was cranberry with a horseradish filling. 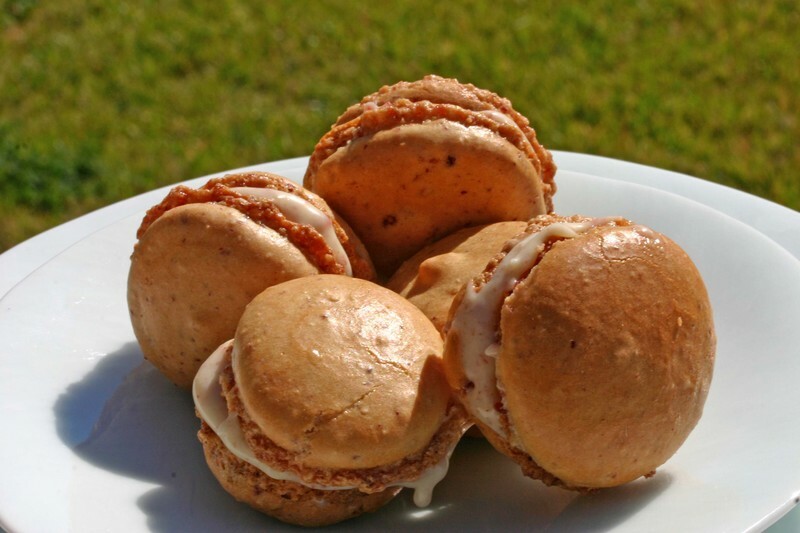 Aki has taken care of the macaroon part and quickly formulated the recipe in ounces. I, not being one for recipes, wrote a formulation of ingredients in grams. Oh well, it lets us use both features on the scale. Here it is. Pumpkin pie hits close to home. The spices, aroma, tastes and most importantly it acts as a carrier for whipped cream. Well, we (being Aki) put together an incredibly light pumpkin pie fritter which I then matched with sweetened mascarpone flavored with vanilla, cardamom and cinnamon. (note above reasoning) Not only is this a great recipe to start using up a pantry full of canned pumpkin, it gives another use for the turkey fryer everyone is afraid to use. Yes, it is much less difficult to drop one ounce dollops of batter into a tub of hot oil in comparison to your twenty pound turkey. Whisk together flour, baking powder, salt, spices and sugar in a medium sized bowl. In a separate bowl whisk together egg and milk and pour over dry ingredients. Stir to combine completely. Add pumpkin puree and blend well. Add peanut or canola oil to a medium sized pot and fill to a depth of three inches. Heat oil to 370ºF. 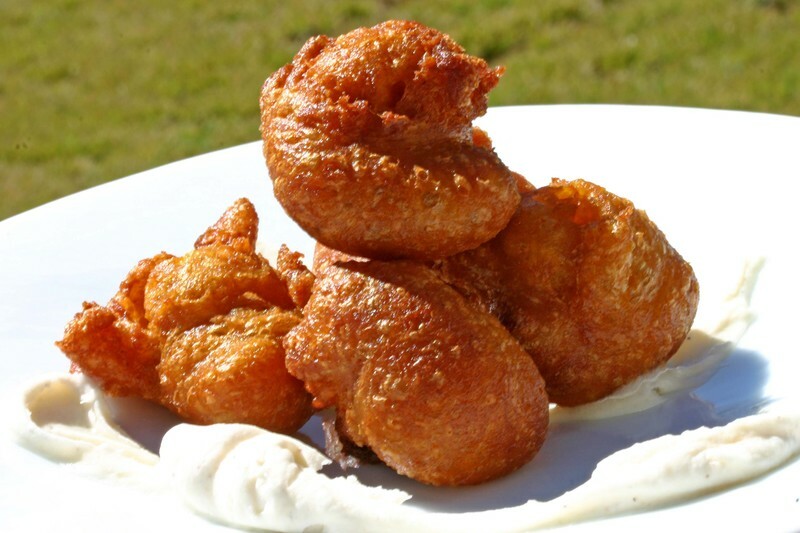 Add batter to the oil by the tablespoonful and fry between 355ºF and 365ºF turning occasionally until the fritters are a deep golden brown, approximately 4-6 minutes. Remove from pan and drain on paper towels. Serve hot with lightly sweetened mascarpone whipped with cinnamon, cardamom and vanilla. I have revisited the flavors of burnt caramel after indulging in the fine chocolates of Recchiuti Confections. So, I ate some great chocolates and now am looking at an empty box. 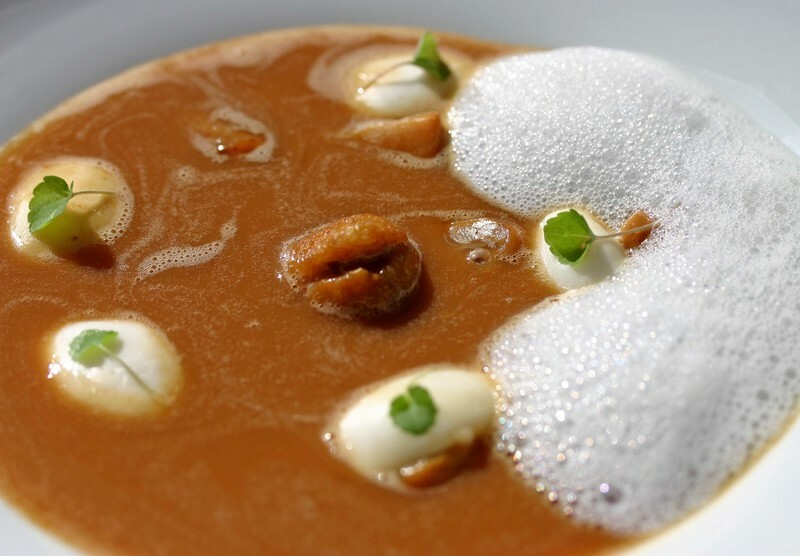 I do have the memory of the burnt sugar caramel and have now integrated it into some savory cooking as well; namely a chestnut and burnt caramel soup. I looked to round out the soups flavor with a couple shots of espresso and some salt. That is it. A bitter, sweet rich soup driven by the complex flavors of burnt sugar. We garnished the soup with marinated matsutake mushrooms, mozzarella gnocchi, anise hyssop, glazed chestnuts and curry leaf milk. Fall in a cup. 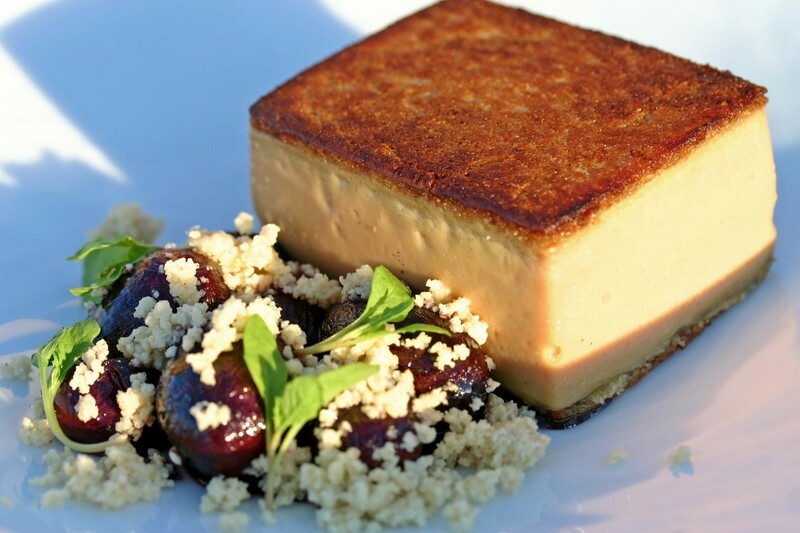 Cold weather calls for hot foie gras. 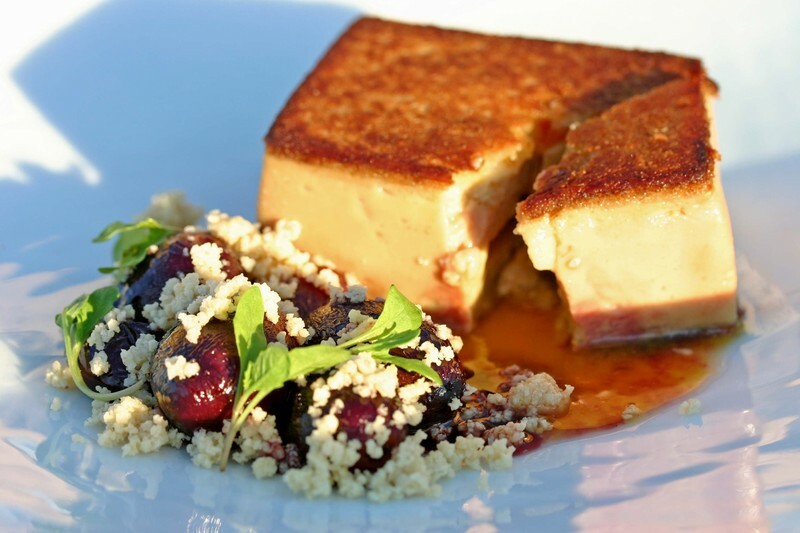 The chill in the air brought my mind back to hot foie gras terrine. This morning I opted to include a bread element with the foie such that the toasted bread like a great grilled cheese protects the creamy interior. I used Texas toast rolled out thin and cut to shape the terrine mold. The crispy crust adds a nice textural difference to the foie gras. Oh, and the surprise of molten passion fruit works well when it blends with the glazed smoked grapes. We are having fun, though I prefer the pictures to do the talking for us. When the shoe fits, wear it. The question is how do you find the shoe? 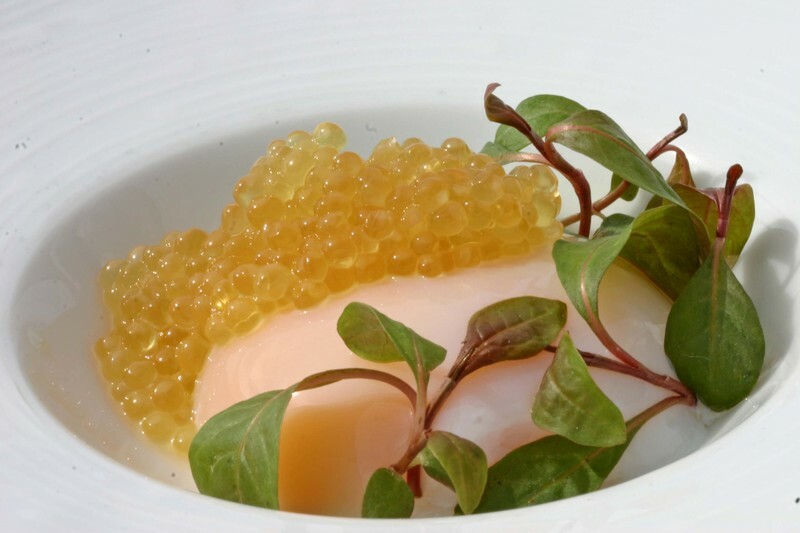 I have been working all weekiend trying to find the right dish to highlight the Wild Char Roe we recently recieved. Our initial findings produced some interesting dishes. The flavors worked well but did not make a mark. 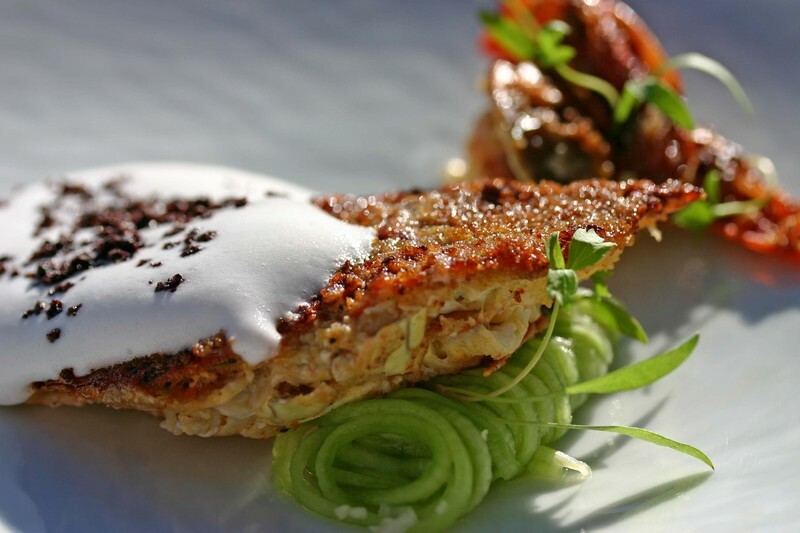 Time away from the kitchen led to the refinement of a dish which puts the roe on stage, just off center, with a supporting cast which weave together the numerous elements into the final presentation. 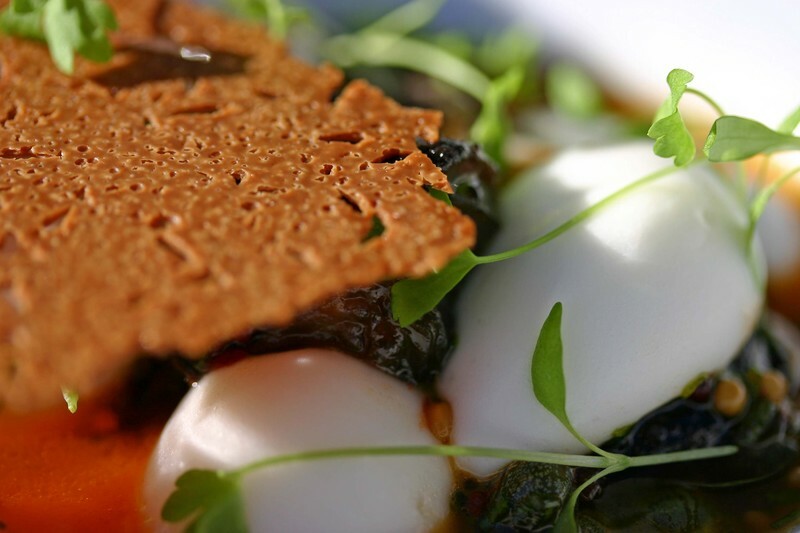 Here we have hot yogurt infused with mahleb, date chip, smoked wild char roe and celery-black lime seasoning. It's a rare weekend off and we are taking the opportunity to enjoy life outside of KG. Of course that doesn't mean that we're not cooking. Alex had a craving for pumpkin pie so at the moment the warm scents of butter and sugar, rum and pumpkin are permeating the house. Half the reason he wanted the pie was for the smell. It wakens the appetite as it slowly escapes from the oven. Your stomach twitches and your tongue salivates long before you are actually conscious of its perfume. It makes this warm autumn afternoon feel rich and full with the promise of warm pie and cool whipped cream. As always, cooking at home is a challenge. Our pantry is never fully stocked and I was lucky to even have enough butter for my crust and a can of organic pumpkin for the filling. The can has probably been in the cupboard since last fall but I suppose that's what cans are for. The only sugar in the house was raw so my piecrust was speckled and slightly pebbled as I rolled it out. The filling was cobbled together from what I had on hand, the pumpkin, three eggs, Goslings Rum, ginger, maple syrup, a few twists of black pepper, a splash of key lime juice and half of the carton of cream which had originally been destined for whipping. Not the most orthodox filling in the world but tasty nonetheless. I used a handful of small forks and spoons on a layer of foil for my pie weights and baked the pie in my oven on a cast iron griddle. Time, and my husband, will let me know if the pie is a success. I can recommend another book for the chocolate lover or anyone who like to work with chocolate, Fine chocolates, GREAT EXPERIENCE, by Jean-Pierre Wybauw. We got our copy from Matt at Kitchen Arts and Letters (212-876-5550). It is a book that has some great techniques and flavor combinations within it's pages. The photography is beautiful and it makes chocolate making seem simple and approachable. It doesn't come cheap, $89.95 as I recall but if you love chocolate it is definitely worth the price. And while I'm thinking of chocolate, the other night we drank a wonderful wine by Ken Wright. It was the 2003 Pinot Noir, Carter Vineyard. The wine was an adult version of childhood decadence as it tasted like liquid Tootsie Rolls with fresh raspberries. It was smooth and rich on the palate and definitely opened and evolved as we drank it. There were hints of coffee and leather in the finish and it lingered on the palate, as any fine wine should. So beeps the timer, it's time to go defend my pie. Otherwise it will be devoured straight from the oven without the required resting period for it to reach it's prime. Sundays at home are a time for resting, reading, mulling over the week past, planning for the future and spending time with the ones we love whether they have two legs or four paws. When you are able and willing to work with individuals who are driven to produce perfection your own standards and results can improve dramatically. Every day I am surrounded by marks of greatness; from Diane’s butter to Steve’s roes and guests staying with us to individuals who visit us visually through our website and push us towards excellence. I thrive off this interaction between individuals and ingredients. Yesterday we were presented with an incredible challenge. 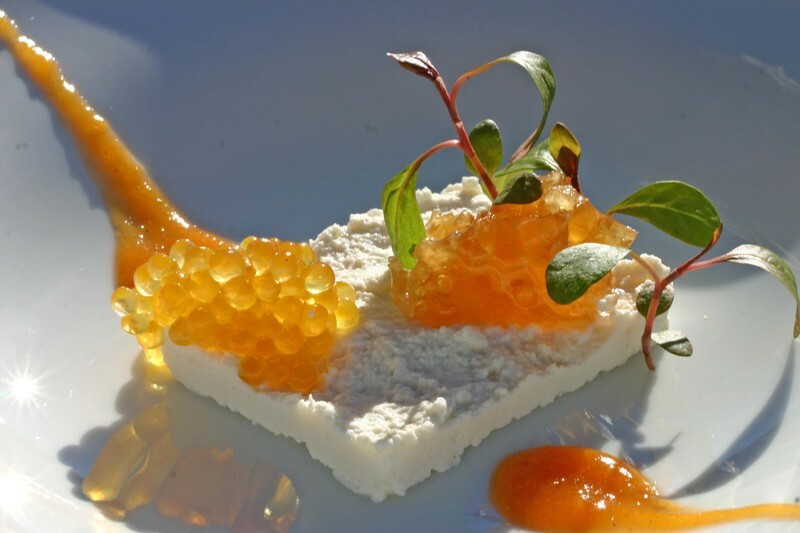 Steve, of blis caviar, has researched and developed a wild char roe. The hoops he has jumped through to bring this ingredient to market are amazing, and we as chefs get to benefit. The roe cured with just fleur de sel is nutty and rich, crisp, herbal and buttery. He has also cured a small portion of the roe with smoked salt. Over the past several years Steve has worked on applying the smoke with a deft hand so as not to lose the natural characteristics of the roe. This morning, when we had the pleasure of sampling these two renditions of wild char roe, I experienced something different. 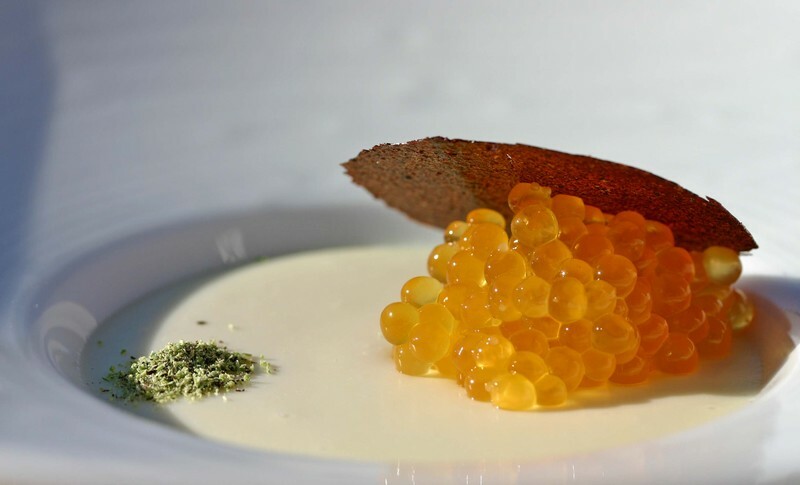 The char roe, larger than brook trout and smaller than salmon roe, golden in color and explosive in texture is better than any of the other roe’s Steve cures. Think about the fact that Steve has stretched himself thin to raise the bar of perfect. Now we are faced with the results. My longing for Chinese food is not waning. Thus, I had an intense desire for fried rice and its flavor profile. Such is life in rural Colorado. Today we made a fried rice milk which we later used as a sauce for a forest mushroom ragout with a fig-horseradish puree and our smoked grapes. The sauce resounds with all the flavors of traditional fried rice without the addition of dairy. I believe the nutty notes and rich flavor came from the slow frying of the rice to which we added the key elements: soy, sesame, ginger and hot sauce. I have been craving fried dumplings. We have not been to a city for over six months and my Jack Nicholson impression from the Shining is remarkably accurate. Many people know fried dumplings and Peking Duck are my comfort food. They help take the edge off. This morning I began by making potstickers stuffed with Buffalo Mozzarella. I needed something to offset the creamy tang of the mozzarella filling and I thought of vinegar, not a tough leap. Well, my mind bounced ideas around and I went to smoked vinegar and then thought about smoking grapes. I had yet to smoke grapes and this became an opportune time to give smoking grapes a shot. After the grapes spent some time in the smoker I pickled them quickly in Moscatel vinegar and Saba. We used the pickling liquid as the base for a sauce to which we added sesame oil and jalapeno. The dish helped take the edge off. I have a thing for spaetzle. I think it stems from fond childhood memories of dining at The Fort in Springfield, Massachusetts. On a side note, if you ever end up in Springfield make sure to dine there and let them know Grandma Kitty says hi. All right, so spaetzle has been ingrained into my culinary template. 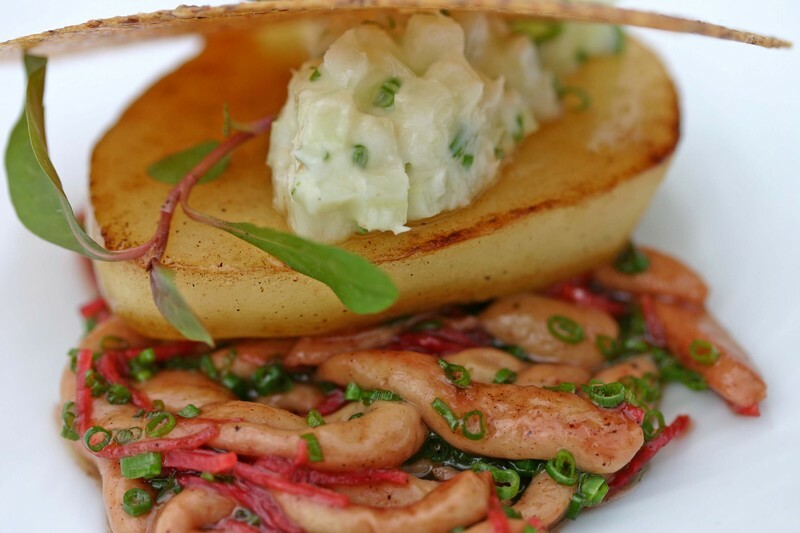 In searching for new flavors and combinations I was able to work through foie gras spaetzle. 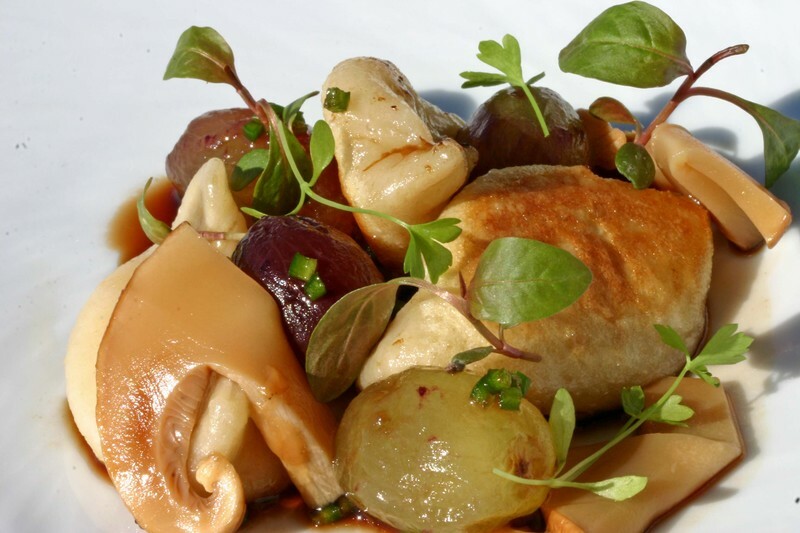 It can be either glazed or crisped and yes it retains its full foie gras flavor with a spaetzle texture. Today we paired it with a cider glazed pear steak with watermelon radish, celery-horseradish relish and a mustard cracker. I quickly went from looking at the simple assemblage of ingredients to a what if scenario. 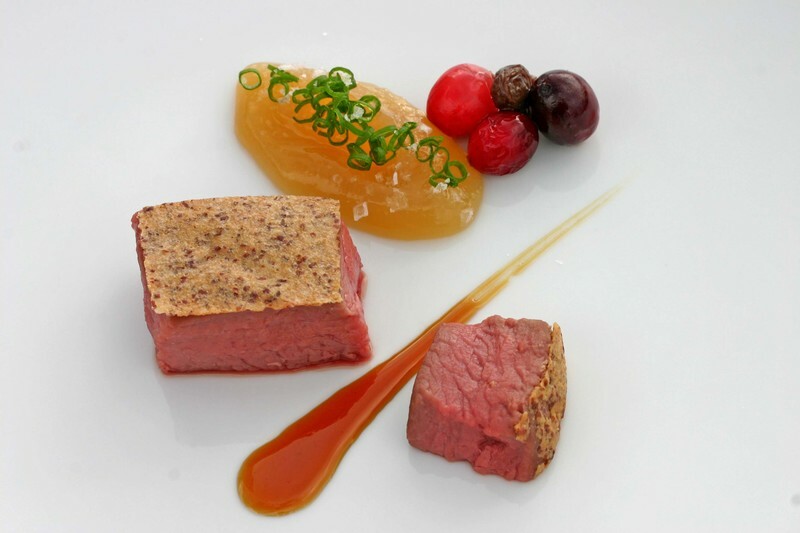 I thought further about our hot foie gras terrine and its applications. 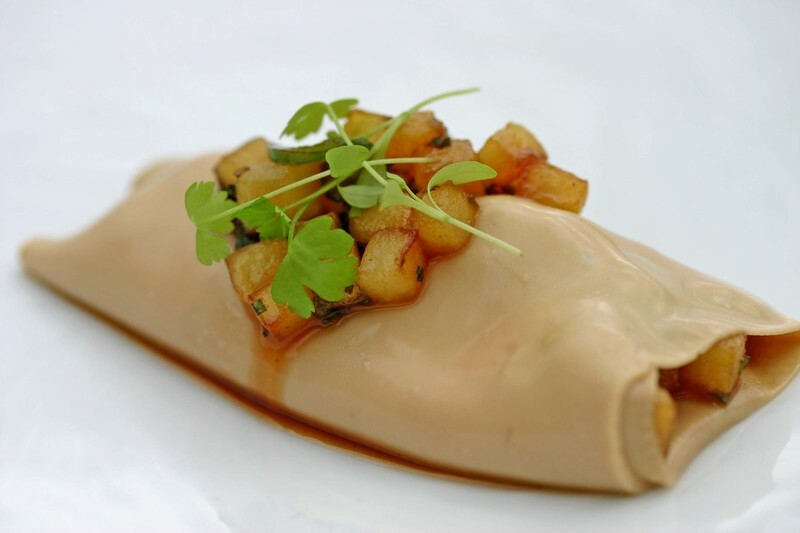 Today I put together a hot foie gras crepe with an apple, barberry, jalapeno filling bound with a cider vinegar fish sauce and topped with young celery. 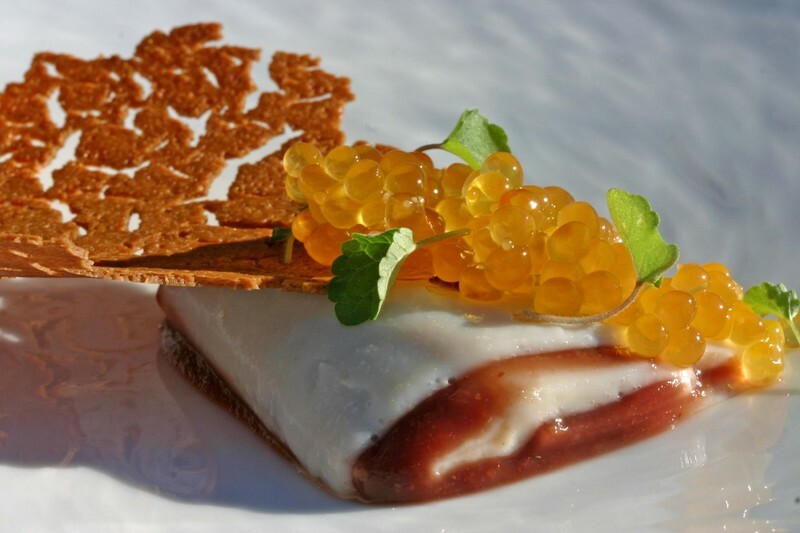 While this is our first attempt with the foie gras crepe I look forward to making a foie gras lasagna as well as a ravioli of foie gras with the same process. Sometimes it is better to be simple. Forget the catch, the trick, the oddity which works, sounds different and can draw attention. Today I took the time to look through that lens and see simple. 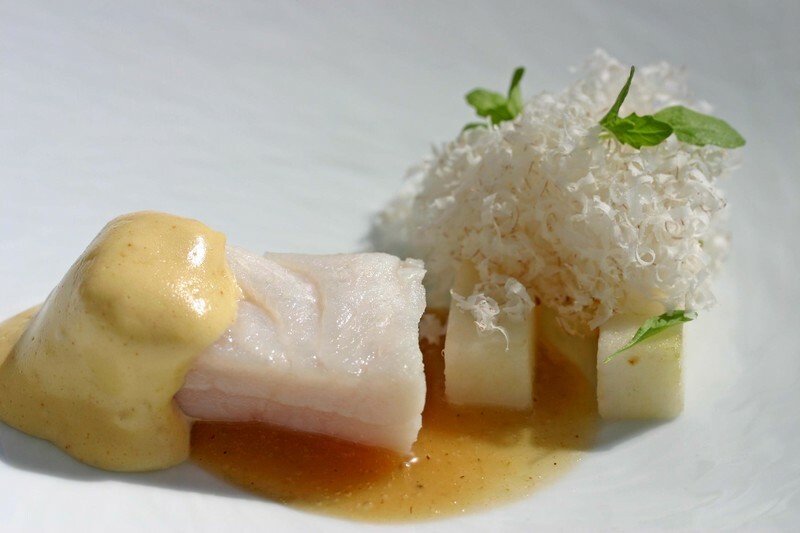 What came about was three pristine ingredients, delicate cookery and artisinal craftsmanship woven together to put ingredients on a higher plane than where they began. I have spoken of blis Brook Trout Roe. We have slow cooked eggs in the style of the Japanese Hot Spring Egg. I gain tremendous pleasure from herbs and spices with poignant bracing flavors. I am happily reminded that simple works, really well. I arrived first thing this morning, forgoing coffee and other necessities in order to fire up the smoker and work with smoked potato flakes. I encountered one small problem, no potato flakes in the kitchen. However, I have plenty of Lays potato Stax. I happily crushed a container of this potato crisp and introduced it to our smoker. A brief time in the Cookshack and the apple wood had permeated the chips nicely. 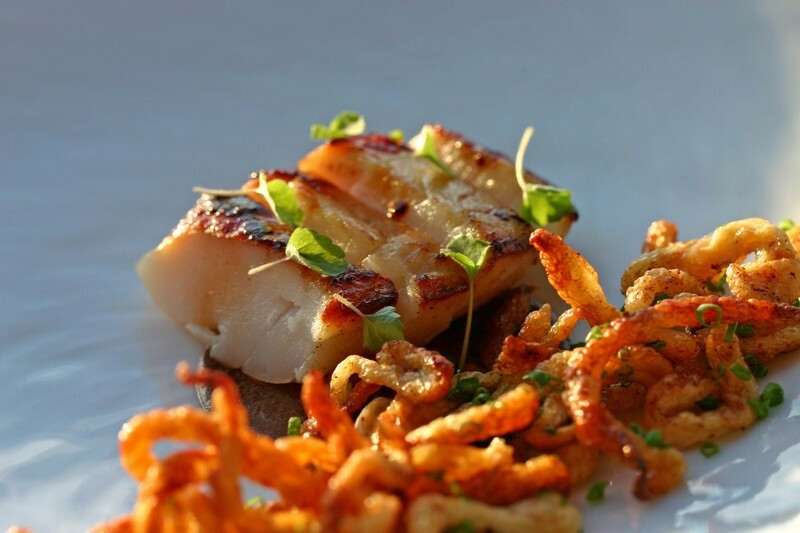 The rest was just assembling the dish, crusting scallops with the smoked crumbled crisps and sauteeing in butter. The other accompaniments were what I had planned on yesterday, celery leaves and mozzarella gnocchi. The calamansi lime added a bright acidity to the dish. I may even just have to serve smoked potato chips or popcorn at the bar, why not the smokers is still on. We belong to a few different wine clubs. They are good for us for a variety of reasons, we can get a discount at wineries that we enjoy, we get pleasant, quaffable surprises in the mail, they help expand our horizons and keep us abreast of any developing trends. As the major wine and beverage buyers for the restaurant we try to stay abreast of new styles and developments in the liquid world without losing sight of old favorites. Unfortunately, when things get busy we can't always devote as much time as we'd like to that portion of our responsibilities. Wine clubs help us to try new things and discover wines that we might not necessariy find on our own. The most recent addtion to our collection of wine clubs is the the one sponsored by Porthos. Porthos is a wine store out of California and has one of the most flexible set-ups that I've seen. There are two different payment levels; you can choose shipments of two or four bottles and you can choose a combination of red and white wine or red or white wines for your shipments. They choose the wines for you, all out of California, (they say that you will be contacted by a "wine concierge" to determine your tastes but we have not experienced that yet) and their guarantee states that if you do not like any of the wines they will replace it free of charge. You can also stipulate whether you want to receive them monthly, bi-monthly or quarterly. We recently received our first shipment and the first thing that I was struck by was the information packet accompanying the wines. They send a full page of information on each wine with tasting notes, food pairings and a bit of background including why they chose that particular wine. The sheets were very entertaining and informative and although we may not agree with all of the pairings I loved reading about them from a different point of view. It was actually a lot of fun and the first wine that we tasted, Three Saints Pinot Noir was quite delicious and had a great story. It was actually quite reminiscent of Burgundy in it's earthy aroma but had the fresh juicy flavor of true ruby grapefruits which encompassed their total profile from the aromatic rind to the pithy outer skin and the juicy refreshing tang of the inner flesh. It was surprising and emminently quaffable with the big flavors and extraction so distinctive to California wines. We are looking forward to tasting the other wines in our shipment and trying some new wines that we might not have tasted on our own. So, if you have any interest in joining a wine club and do not want to be married to one winery in particular, may we suggest Porthos. You might learn something new and taste something worthwhile, we have. Baked jalapenos just went in the oven. 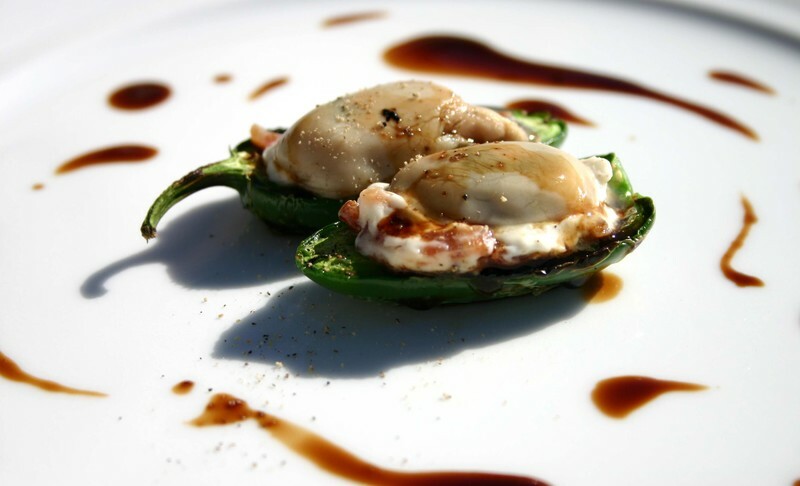 These are charred jalapenos which are then seeded, stuffed with cream cheese and wrapped in bacon. I am a lucky man, for all I must do is eat these decadent bites. 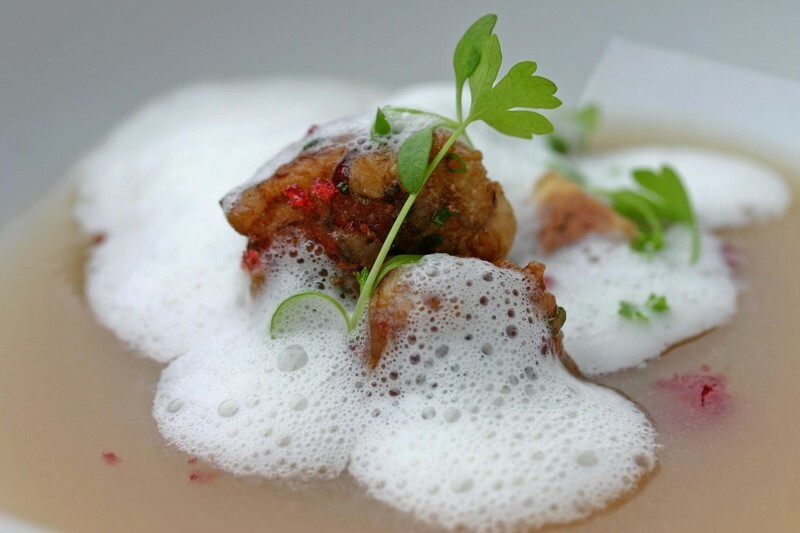 In fact, they inspired a dish we did a few months ago with warmed oysters. The waft of sizzling baking bacon and roasting jalapenos triggered something in my mind, something close to smoking. As the food world knows, Wylie at wd-50 has rightfully autographed smoked mashed potatoes. We plan to smoke, the sky is falling staple, potato flakes and use them in a varriety of manners as crusts. Smoked rice and grits work well, though the rough uniformity of potato flakes is something special. Similarly, I plan to smoke chicken, duck and pork skins for crisps, chips, and just good flavored additions to dishes. 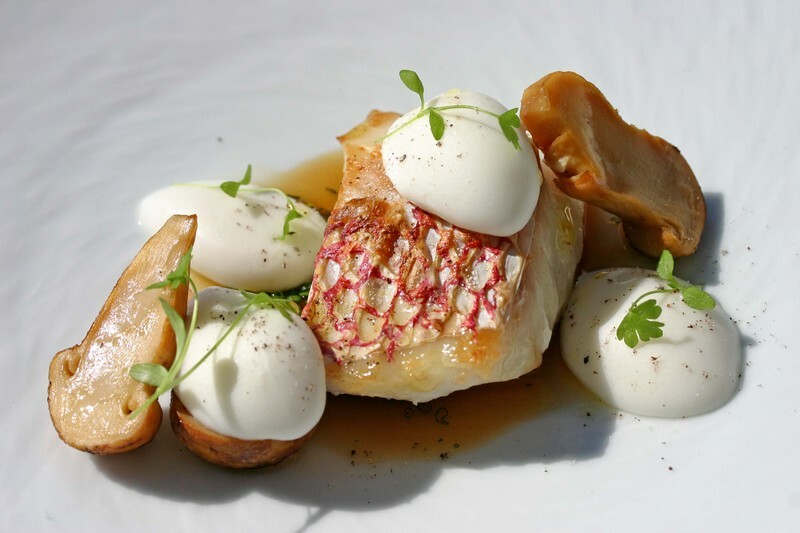 I am looking forward to seared scallop with smoked potato flake, mozzarella gnocchi and celery leaves. It is amazing what can inspire and influence our food. This morning the clouds were sitting below us in the valley. The sun began to rise dancing of glistening evergreens and reflectinf off of orange and yellow oak brush leaves. If only I could capture these natural wonders on a plate. So I tried, and with some careful editing captured falls light with some pretty remarkable ingredients. 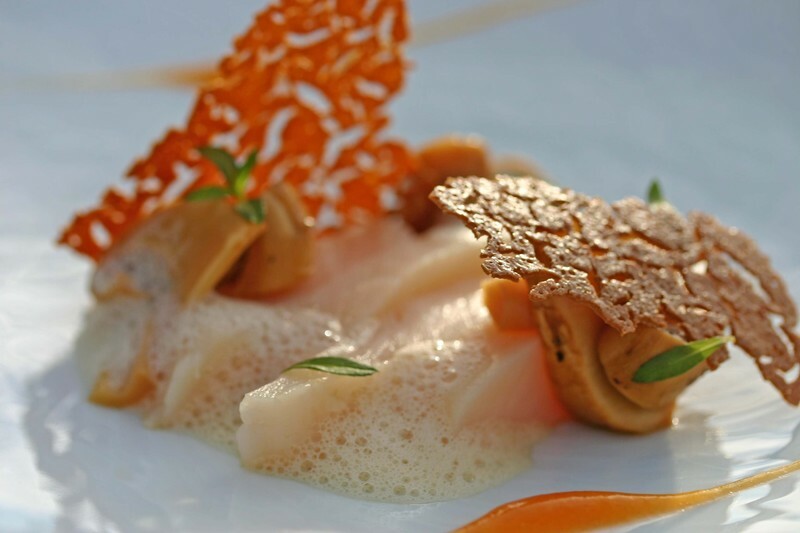 The dish began with our poached scallops, slice thick to show off their texture. We added preserved matsutake mushrooms with a natural vinaigrette. 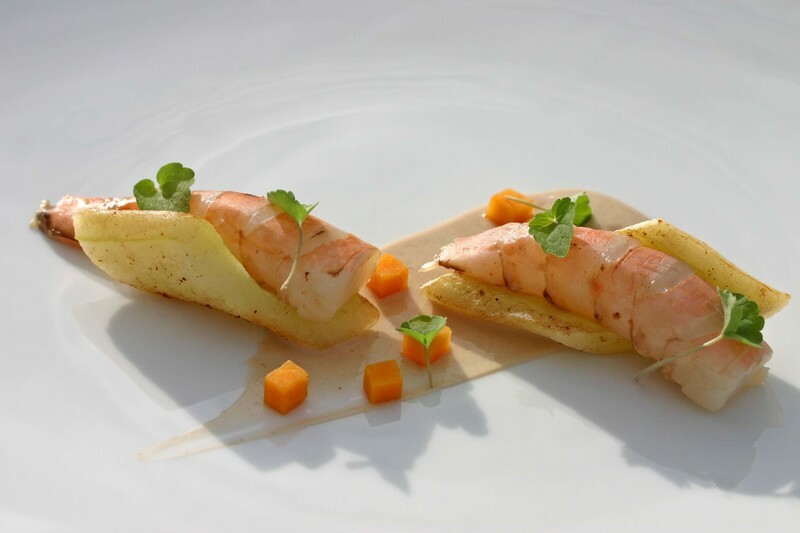 To balance the acidity we tied in a persimmon-vanilla puree. Tarragon added a brightness and our tofu-yogurt crackers added a caramelized texture to the dish. Today, with my head above the clouds I was able to let weave cuisine and nature together. I think about food, a lot. Because of the culinary ping pong which takes place in my mind I end up filling notebooks with ideas, concepts and thoughts on food. Our blog has helped me focus and execute ideas, yet there are hundreds of ideas I have not visited for years. I continue to jot down thoughts and then type them into the computer in order to free prescious mind space for new thoughts. Today I am going to use technology to open my yellow notebooks to the world. This is a compilation of notebbooks from several years ago, ones I have not visited for awhile. Enjoy, and please remember these are only ideas from my yellow notebooks not completed dishes. With that in mind, the way the program works is that it is an open medium such that anyone is able to simply read or make changes in the writeboard. If you have new ideas or evolutions please make them and save them as the next step in a progression of ideas. Or, just sit back relax and enjoy my culinary ramblings. My only request is that the ideas remain true to the nature of food. I believe this will work. The password is yellow. We combined our pear spaetzle with sea scallops this morning. We also found a better means for cooking the spaetzle. After poaching them they saute beautifully in brown butter which concentrates the pear flavor. Furthermore, our adapted cooking method (dropping the spaetzle out of a zip loc bag with a hole cut in the corner) allows for larger spaetzle and a more functional means of cooking to order. Anyway, I wanted to show our evolved spaetzle in a new dish. Today marked the successful execution of pear spaetzle. 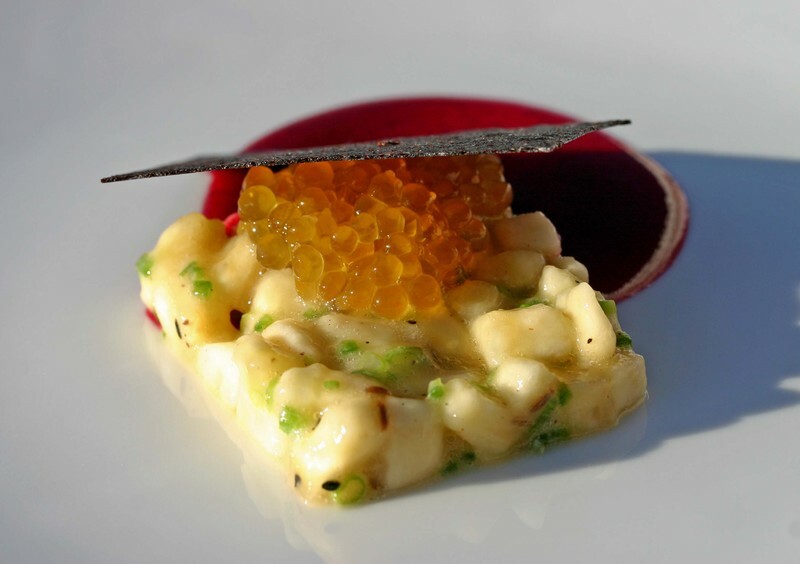 The spaetzle is made with a mixture of bartlet pears, silken tofu and bound without eggs or flour. 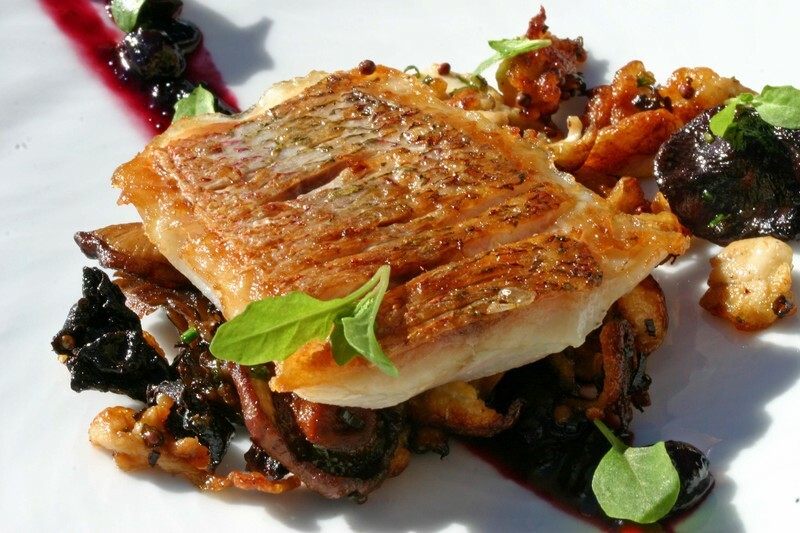 We paired the sauteed spaetzle with Yellow Tail Snapper, roasted mushrooms, epazote and huckleberry-fermented black bean confiture. The spaetzle hold up quite well both in hot water for poaching as well as sauteed with the mushrooms. Cheese and crackers were a staple at any cocktail party I went to as a child. For a good stretch of time the condiment of choice was a dollop of red pepper jelly either on top of the cheese or in a crock on the side for guests to adjust their own application of jelly. Feeling nostalgic, I took another stab at the old cheese and red pepper jelly combination. We began by making a sweet and sour sauce with the red pepper jelly and capers. To that base we added yuzu pickled mustard seeds and chives. 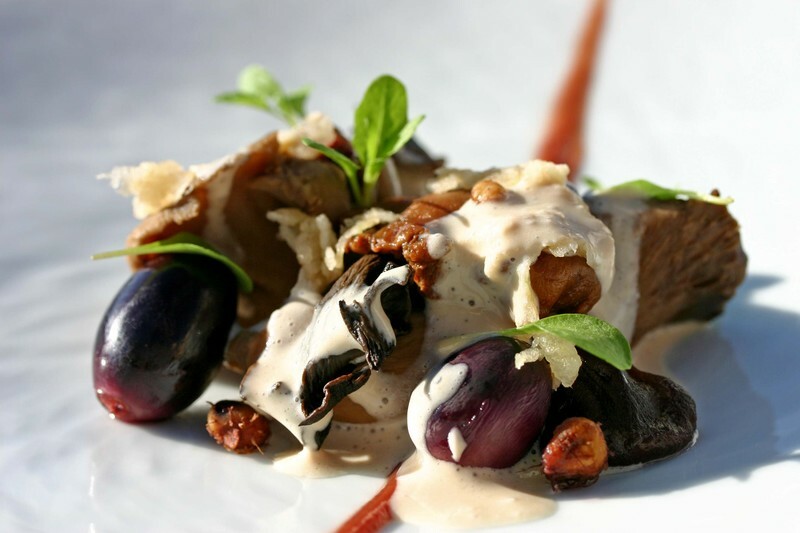 We used the sauce to warm some large snails to which we added our mozzarella gnocchi. 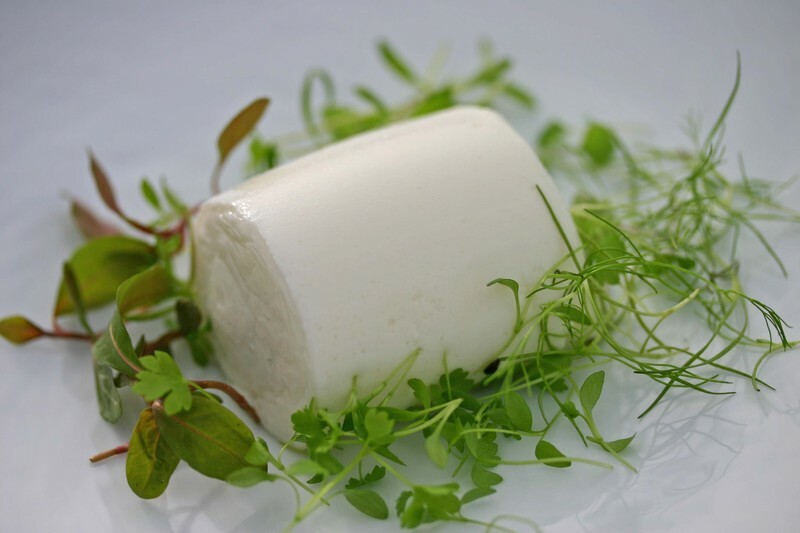 We added some young celery to brighten the flavors and accompanied the dish with a cracker made from tofu, yogurt and smoked vinegar. It is a perfect fall day. The sun is finally shining in a clear blue sky and the reds and golds scattered across the mountains are beautiful. Colorado doesn't have the blanketing foliage effect that you see in New England but the colors seem to stand our even more, perhaps because they are like patches of hidden treasure that appear in the most unlikely of places. Even the scrub oaks are turning colors and the golden aspens are rustling musically in the breeze. The patio beckons for it's last few hurrahs as we linger there enjoying the contrast of the foliage and the already snow topped peaks in the distance. Sitting on the deck you can hear the rumble of pick-up trucks in the distance. As ever increasing gas prices loom people are driving in and out of the forest with trucks loaded with cords of wood. The old-timers are predicting a long hard winter and no one wants to get caught unawares. Here in Pagosa fireplaces and wood stoves are common and everyone is stocking up for the winter. On the bright side, locals are hoping that Wolf Creek will be open by Halloween. People are betting on the exact date that the slopes will be open. Here in the valley though, the days are still warm and frost in the mornings is as close to snow as we get. This weather is perfect for ribs. 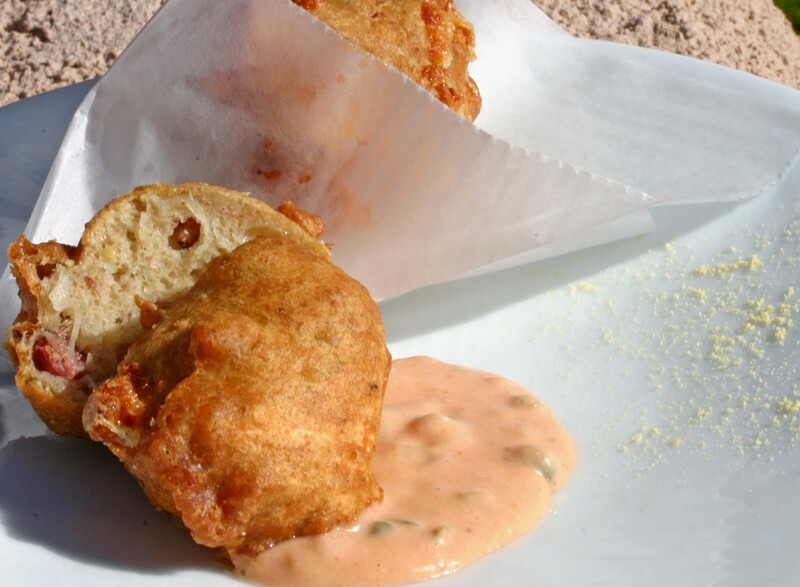 Although we serve them all summer long, somehow they taste better with the scent of woodsmoke in the air. I have yet to meet any rib eaters that didn't love our five hour ribs. 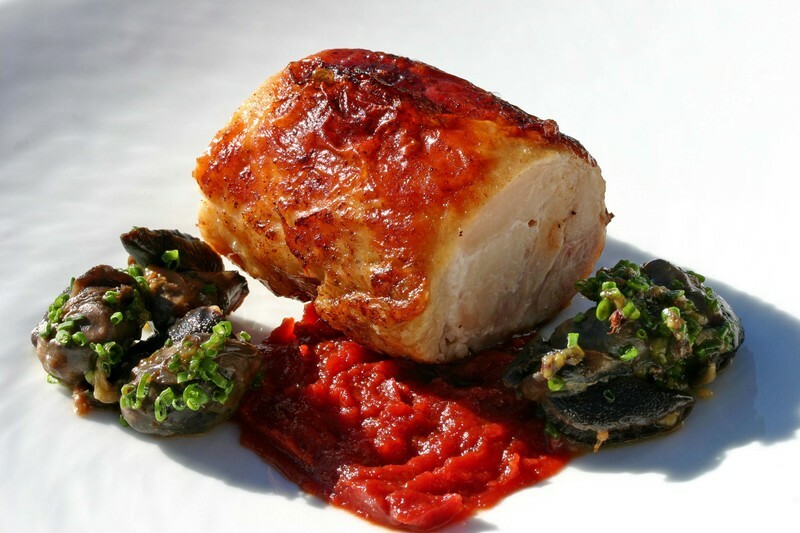 The recipe has been with us for years and we have shared it with family and friends for it's great flavor and it's ease of both preparation and clean up. The ribs can be seasoned lightly with salt and your favorite hot sauce during the initial cooking if you plan to slather it with sauce before finishing or you can use your favorite dry rub recipe to season the ribs and then just broil them dry for a crispy, caramelized finish. We serve the ribs with a very simple cole slaw. It consists of cabbage shredded the way you like it with a generous splash of your favorite wine vinegar and judicious pinches of sugar, salt and freshly ground pepper. The cabbage will be sweet and tangy, crunchy and slightl hot from the peppercorns. It's healthy and refreshinng qualities will make you feel almost virtuous as you devour rib after rib with jalapeno cornbread and icy cold Sierra Nevadas . They're not local but they are our favorite brew with these ribs which we slather with ginger ketchup sauce before finishing. * If you prefer, substitute your favorite dry rub for the hot sauce/salt combo. Rub meat with hot sauce and season lightly with salt or season well with your dry rub. Vacuum seal in a slightly over sized bag and place in a pan of water large enough to accommodate the whole rack. Tuck the extra bag underneath the ribs. Cover with a layer of plastic wrap and then one of foil. Place the pan in the pre-heated oven for five hours. Alternatively, wrap the ribs in two layers of plastic wrap and then one layer of heavy-duty foil. Place the ribs on a sheet tray and put them in the pre-heated oven for five hours. 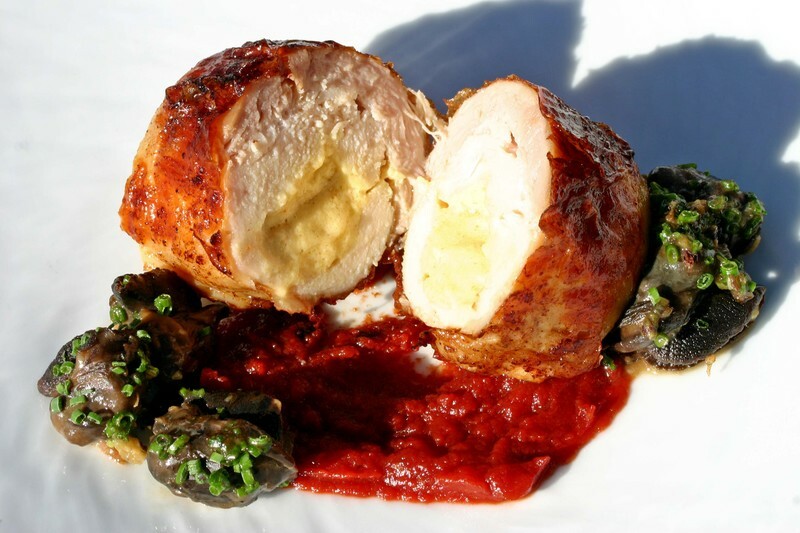 Remove from oven and let rest at room temperature for one hour so that juices can be re-absorbed by the meat. Open package and chill or use immediately. Use pork jus from cooking in beans or add to your sauce for extra flavor. Portion and brush ribs with your favorite glaze or sauce and broil to a crisp chewy finish. If reheating the ribs from cold, they are easier to portion chilled, broil at low for five minutes on each side to heat up the ribs before brushing them and finishing. In a non-reactive saucepan slowly reduce soy and vinegar on a low flame to the consistency of maple syrup. Pour into blender and add ketchup and ginger. Puree thoroughly. Strain. Sauce is ready to use as is but can also be heated in smaller amounts and finished by swirling butter into the warm sauce. Use with steak, five hour ribs, grilled fish, and whatever else suits your fancy. I have recently been working on apple spaetzle. Unfortunately, my failures have been greater than the successes. However, I am slowly learrning to capita lize on these misteps. This morning led to the evolution of jellied apple sauce. The apple puree is made with Honey Crisp apples--tart, sweet and cleansing on the palate-- and jelled with Methocel Food Gums. 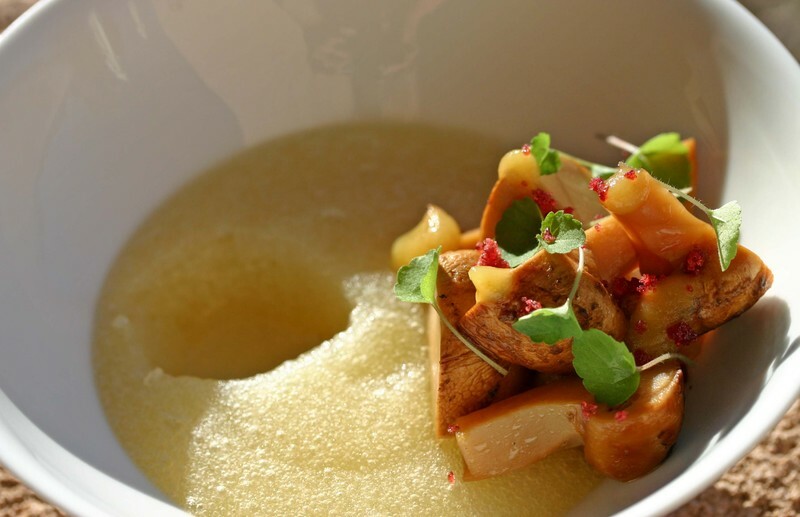 We warmed the apple sauce in a bowl and topped it with a warm salad of matsutake mushrooms dressed with pine nut oil, yuzu puree, ground cranberries and anise hyssop. The apple sauce is cuttable with a spoon though a puree in the mouth, the best of both worlds. It appears fall is upon us and truly influencing our cuisine. I woke up this morning and the sun was shimmering on the evening's frost which blankets the meadow in front of our house. Today is a good day. I began making coffee and getting ready to see what was going on in the food world(Wednesday is paper day, digital in our case) As I sat down to begin reading the phone rang and the words "did you see" started the conversation. As it turns out, The New York Times did a well deserved piece on Diane St Clair, her incredible cows and work ethic. Diane, for those who do not know, makes Farmstead butter from scratch and with an undying love of quality. That is the key. Diane should get more attention and press. Every guest that comes through our doors gains an intimate knowledge of Diane, the cows and the work she puts into providing us the worlds best butter. Her picture with three of the cows resides in our kitchen for all to see. View this photo Sometimes, it even parades around the dining room. Without our relationship with Diane, we would merely be serving butter on the table. Instead, our guests get an improved and inspired knowledge of ingredients. At the end of the day that is what is so incredibly special. Diane did not set out to be famous, she set out to be perfect, and we are lucky enough to be able to share her gifts. I am fascinated and particularly drawn to the flavors of curry leafs. I find both their flavor and aroma intriguing and captivating. I note toasty, tar, peppery earthy, buttery notes, with green grassy undertones though truly with words I am unable to truly describe their full depths and characteristics. Fortunately, I am able to capture and highlight these aromatic leaves in several forms. Most recently, we made a sauce with skim milk infused with curry leaves and enriched with white chocolate. Why the white chocolate? I am not quite sure, though in my own mind and palate I find the rich sweetness of the chocolate a great vehicle for rounding out the intense flavors of the curry leaves. Today we paired this new sauce with sauteed rock shrimp, butternut squash relish, chufa nuts fresh and dried. 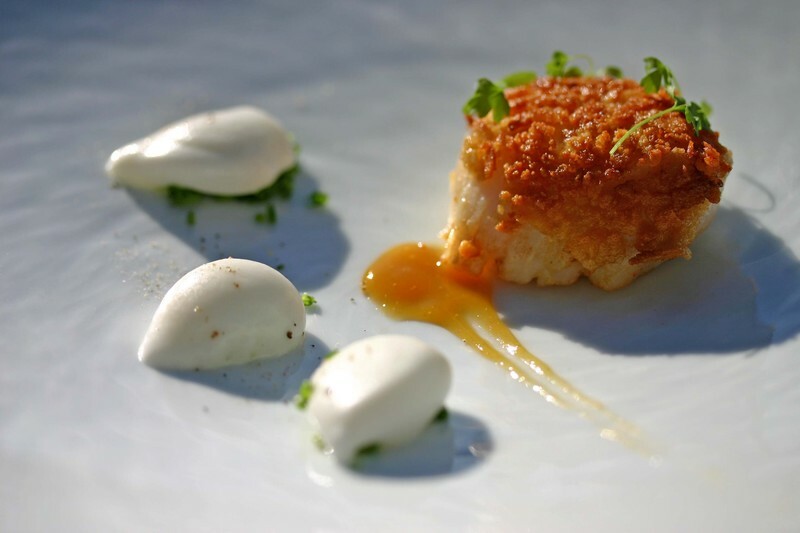 In our attempts to continue to refine and develop our cuisine we spend hours working through failure. Today has been a constant struggle for while our ideas are sound the results are quite unremarkable. (apple spaetzle and chestnut dumplings) Furthermore, I am not a big fan of failure. It is draining on both me and those around me. How then do I overcome these obstacles? I need to put them past me and realize that the failure is only part of the process, not the end result. And thus it is important to remember the key is to work through failure, not just to it. It's a rainy, windy day. The storms have been cycling in and out of our area since yesterday and we saw some spectacular displays of lightning last night and this morning. My older dog avoids looking out the windows at all costs when thunder shakes the house and lightning streaks across the sky. I am sympathetic to his distress but I have to admit that I love watching the storms. Here at the Guest House people can sit in the darkened Great Room and watch the show through multiple windows and glass paned doors. I arrived this morning to the smell of woodsmoke in the fireplace and the sight of guests relaxing on the sofa with coffee and watching the storm. Our East Coast guests tend to be early risers here in Colorado, occasionally beating me into the kitchen for their morning coffee. They looked warm and cozy and completely relaxed. It was a a peaceful moment before their day really began. This afternoon after hours of watching the rain come down in sheets, people were antsy and slightly distressed. Those who had braved the weather were chilled and bedraggled. The solution? Warm walnut pie with a dollop of freshly whipped cream and steaming cups of coffee. Pecan pie can be a wonderful thing but sometimes we crave something with a bit more subtlety. Honey walnut pie is a bit lighter and creamier with a warm golden hue and soft floral notes from the wildflower honey. This recipe is bursting with nuts and simply delicious for those moments when nothing else will do. Place the walnuts in a large heatproof bowl and set aside. Heat honey and sugar together until the sugar dissolves. Add salt and let cool for 15 minutes. Add eggs one at a time, incorporating each egg fully before adding the next. Stir in the cream and pour over walnuts. Fold together to thoroughly coat the nuts and spoon the walnuts into piecrust. Slowly pour remaining liquid into the crust; you may not need all of it to fill the pan. Bake 35-45 minutes until golden brown and just firm to the touch. We had a few softshell crabs left to work with, so we began working on flavors to compliment them. This morning yielded an interesting dish where bananas and capers came together to make a warm condiment to the sauteed softshells. The capers briny acidity worked well with the caramelized sweetness of the bananas. 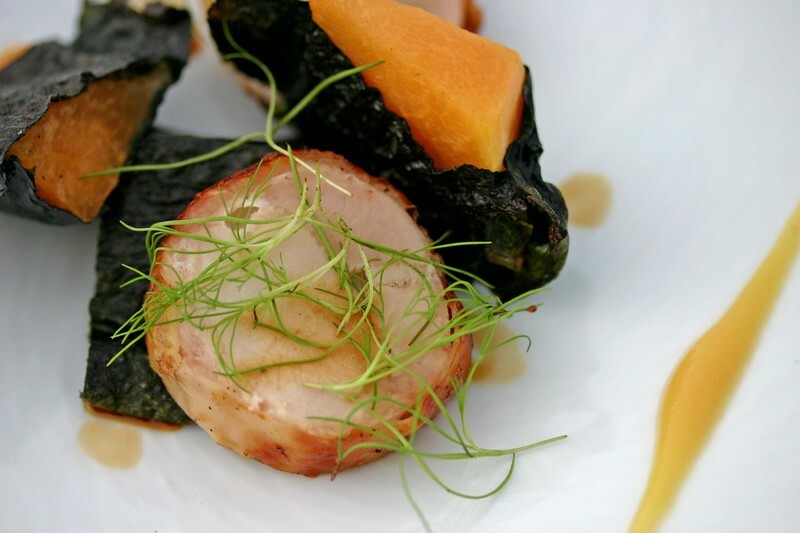 We added an earthy element to the dish with preserved perigord truffle puree and added a sweet heat with our mango kosho. 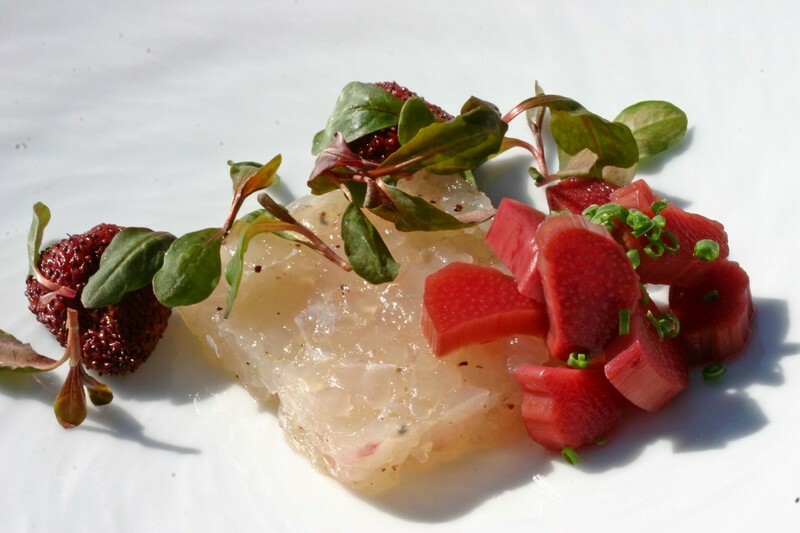 Young shiso rounded the dish with an herbal overtone to pique the palate. Due to technical difficulties, we have discontinued Bloglet and transferred the e-mail service to Feedblitz. Anyone who subscribed to Bloglet was transferred over to the new service. Apparently we are not as technically savvy as we thought but we have tested the new service and it appears to be working for us. Thanks for your subscriptions and for your patience! Skate wings are never thick enough. To fight this never ending battle we have begone sticking them together and poaching them like pork belly, then pressing and chilling it to set its shape and texture. 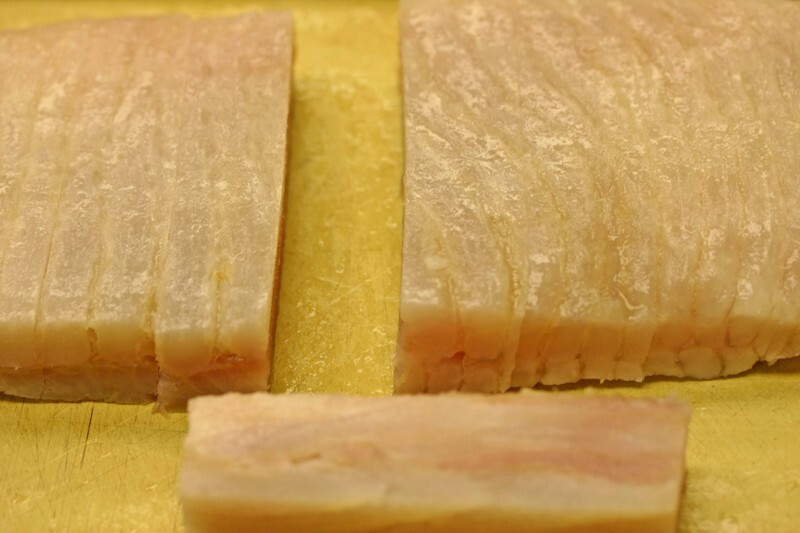 Finally, we are able to portion the skate into loins which we saute, though breading and frying is also an option. 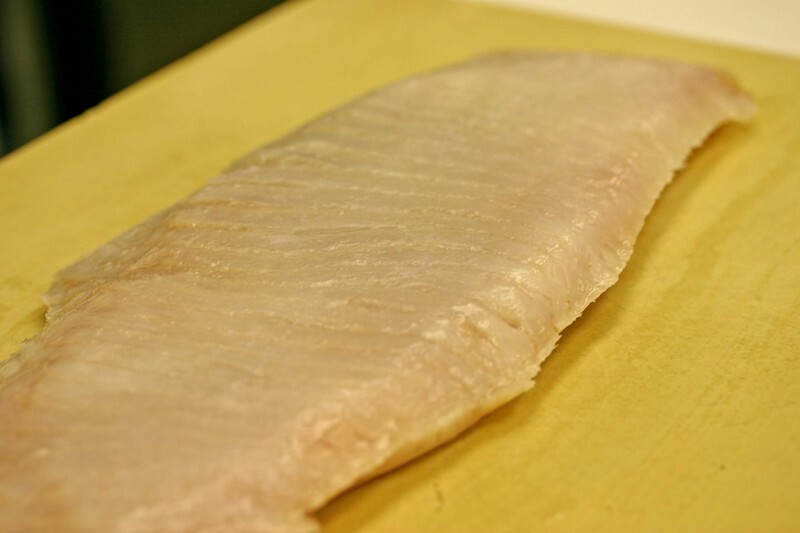 Today we are serving the skate loin with apple puree, smoked cider, mustard-caper chips and chives. 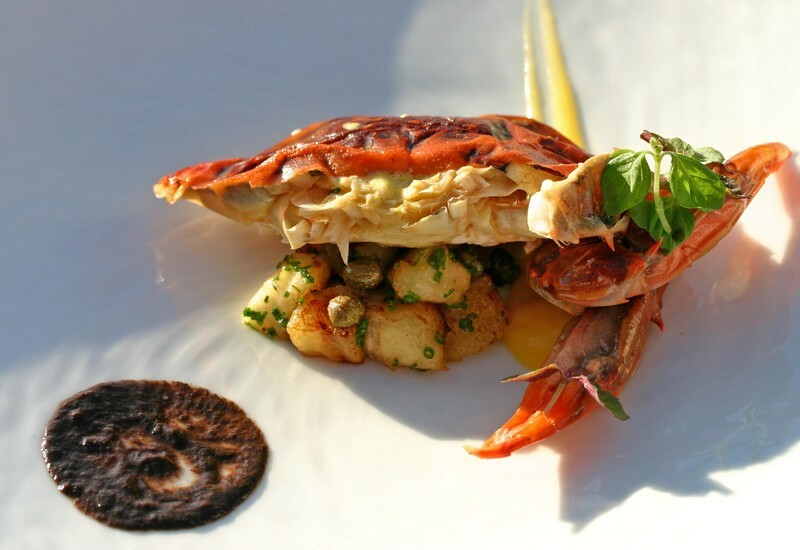 Softshell crabs, ramps, morel mushrooms and hay fever seem to all come together at the same time and mark the begining of Spring and culinary promise. Well, I recieved a phone call and at the other end was someone telling me they had fresh softshell crabs. Impossible. Normally softshell crabs would be long gone, becoming a distant memory as the cold chill of fall encompases the evening air. However, because of unusually warm water temperatures and a bit of luck softshell crabs arrived on our doorstep. What a treat for us, since we sort of missed the softshell crab season as it is normally delineated. Today we applied our reheatable hollandaise sauce to an actual dish. This is a dish we have not worked with in over six years. When we had our small catering company we were faced with looking at roast chicken through a new set of eyes. We did not have the hands or space to roast numerous chickens at once for the events we did. Instead, we spent hours taking apart chickens, massaging them with flavored butter, reassembling them with white meat on the inside, dark on the out and the skin around that, finally trussing each individual portion to be roasted later in the evening. When we stopped catering, I shelved the dish. Well, we recently reapproached the dish with new eyes, techniques and ingredients in our repetoire. The dish still retains the same elements from yesteryear though now we stuff it with true hollandaise sauce and we no longer need to truss the birds. I am quite pleased with our current rendition of an individual roast chicken. While we have been cooking in the west for nearly three years, we rarely repeat dishes. One reason for the lack of repition is that we are in the middle of nowhere and regulars just are not that regular. The other reason is that I get bored quickly. When we are able to perfect a dish, it is shelved. We do revist flavors and techniques, that is for the most part impossible not to repeat, but dishes as seen today are not seen tomorrow. In the same manner, we are evolving, fining and looking to get better everyday. Because of this simple fact, what is great and pleasing to us at one point may be improveable at the next. Sure, their are dishes we would not change and thus we do not repeat them for as we evolve change is inevitable, accepted and desired. Thus, I present some ideas for Fall. This was the very first menu that we served at Keyah Grande. We had literally, just arrived from Maine and were not open yet, construction on the road and parking lot had yet to be finished and a CO was still months away. It was the first meal that we cooked for Peter Stanley, the GM at that time and a "getting to know you" experience for us all. Happily almost three years later, looking on back on this menu I can honestly say that I wouldn't change a thing.